Last week I wrote about establishing the practice of family worship and devotionals. There I encouraged the practice of daily scripture reading in our families. That suggestion begs the question of where to start? For those desiring to create the habit of daily bible reading, deciding where to begin and how to proceed can be intimidating. Thankfully, there are several suitable and easily-accessible options to get started! Where not to start...as I said before, I am not a fan of plans that go through the entire bible in a year for family devotional time. While I am certainly all in favor of reading through the bible regularly, doing so in a year requires a lot of reading, and in my experience these plans cover so much ground daily that it is difficult to read thoughtfully and prayerfully, especially if you have young children. Instead of trying to read through the bible in one year during your family worship time, let me offer two alternative suggestions, each with two options. For those wanting to build familiarity with the bible as a whole. If you or your family are new to the faith or simply want to review some of the basic teachings and beloved bible passages, I wholeheartedly recommend the reading plans in the Quest Study Bible. This study bible has three reading "courses" that actually offer a total of five separate plans. Listed as "Course 1" are three individual two-week plans that cover the life and teachings of Jesus, the life and teachings of the Apostle Paul, and a two-week survey of the Old Testament. These are a great starting point for new Christians or for parents looking for a place to start instructing their children in the basic stories and teachings of the bible. "Course 2" is a bit more ambitious and consists of a six-month plan to read 186 of the 1189 chapters in the bible--including at least one chapter from every single book. This is a very solid plan for getting an overview of the bible and is the plan that we're using in our family right now. You'll notice that some very familiar chapters are intentionally left out. For our use, we're taking the liberty to add to the suggested readings. Similarly, there would be no harm in choosing to omit some readings along the way. For those wanting to dive in and read all or nearly all of the bible. 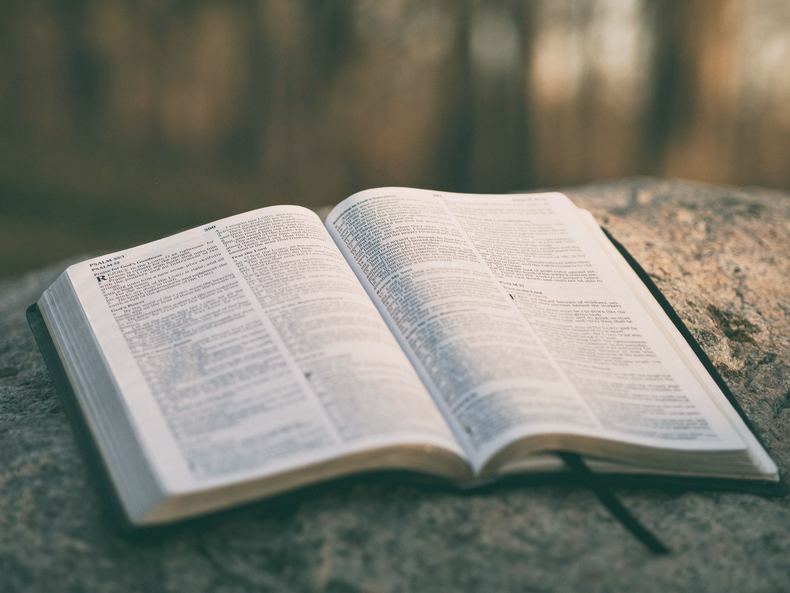 If you really want to go through the bible in its entirety (or at least most of the bible), there are a number of good plans that take two or three years--providing daily readings that are small enough as to be read prayerfully and encourage family discussion. Depending on the age and attention span of your children, I am definitely in favor of skipping some parts during your family devotional and worship time. Some parts of the bible can be a bit difficult to read devotionally (the censuses of Numbers, for example) while the NC-17 rated parts of the bible are probably best left out of family time, especially with younger children (Judges 19 comes to mind). Also from the Quest Study Bible mentioned above, "Course 3" is the most ambitious and covers every word of the bible in a very manageable three-year period. All of the Reading Plans from this study bible are available in the Google Books preview of the Quest Study Bible found here. I am not aware of anywhere else online where these are available, but if you know where they may be found, please let me know in the comments! If you want to tie your daily readings to the church year and the various seasons and festivals observed as part of the church year (i.e. Advent, Christmas, Epiphany, Lent, etc. ), the Daily Lectionary from the Book of Common Prayer is a great resource. The readings found here are obviously used by Anglicans and Episcopalians, but they also appear in devotional works and hymnals by Lutherans and others. This is one of the most widely-used daily reading plans in the Western Church. Crossway Bibles has a website, Daily Office Lectionary where the readings from this plan are posted daily and may be read or listed to from the ESV bible. This website is a tremendous resource! In addition to these two plans, many church hymnals (they still exist) from liturgical traditions offer their own daily bible reading plans. From a Lutheran perspective, The Lutheran Hymnal (1941), Lutheran Book of Worship (1978), and Lutheran Service Book (2006) all offer solid, one or two-year reading plans for family devotional time. As I said in my initial post, the most important things are to start small and be consistent. The fact that you are reading the bible each day in your family is much more important than sweating the details of exactly what you are reading every day. No need to wait for Advent (the church's new year) or New Year's day to start reading the bible each day. Let us heed the advice overheard by St. Augustine, when he heard the child singing, "Take up and read! Take up and read!"